Dough Gibson shows the area that's affected. 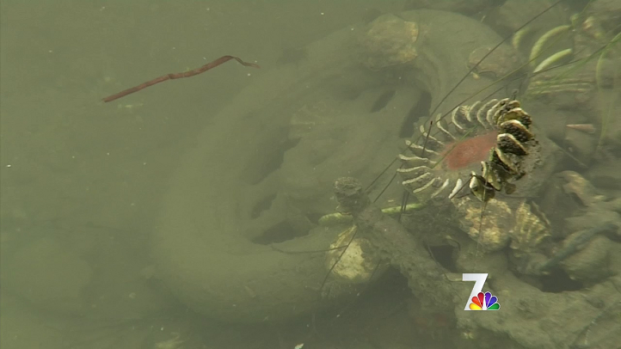 A group will be removing various junk that was discovered in the San Elijo Lagoon, according to officials. Trash, old car engines and tires will be removed from the large wetland area during the county-wide Coastal Cleanup Day. Scientists discovered the dumpsite near the shore of the lagoon a few months ago and have been investigating why so much junk is in the area. "Things that have been here for a long time, 40 to 50 years, for us it's sort of a crowning achievement of getting rid of that past mentality," said Gibson. "Nobody thought about what it was going to do to the future." Scientist Doug Gibson talks to NBC 7 reporter Steven Luke about a trash discovery in the San Elijo Lagoon. A $20,000 grant is paying for the cleanup. Money is allocated from the Water Resources Control Board through fines people pay when illegally discarding trash. Volunteers will help remove the items, including a wagon wheel, this weekend during the I Love A Clean San Diego event. For more information about Coastal Cleanup Day check out the event website.